Simple, healthy meals are a must at our house. Already in just the first couple weeks of Fall it’s like our schedules are on overdrive! 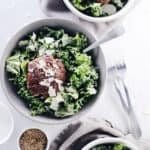 This Paleo + Whole30 Korean beef bowl is on the table in under 30 minutes and is a family-friendly meal. 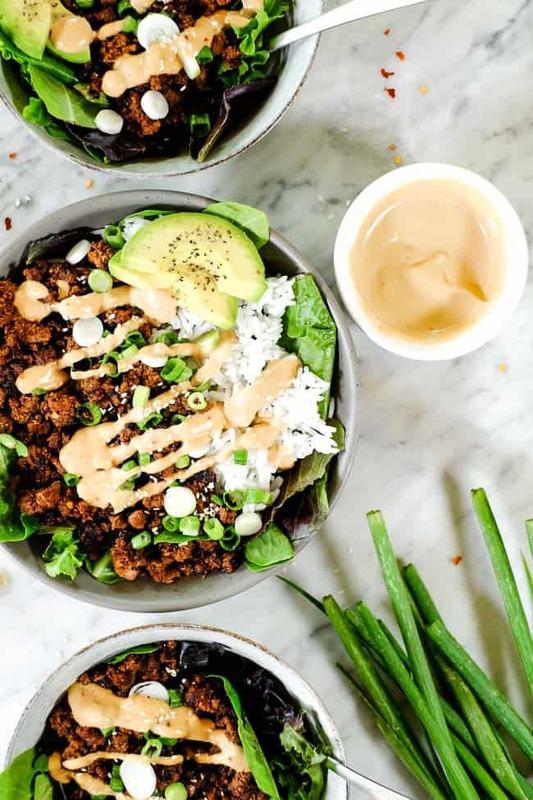 This Korean beef bowl is gluten-free and dairy-free, and the leftovers make great lunches, too! Pretty much all year long, but especially when life gets busy, quick and easy meals are our favorite! 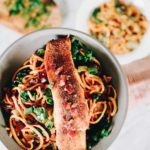 We love cooking and spending time in the kitchen together, but we also love having dinner ready in under 30 minutes! I mean, who doesn’t?! Justin is coaching a boy’s flag football team this Fall and I am heading back to teaching barre classes, which means 3 evenings out of the week will involve activities that take us away from our home. While it’s fun, it can also be tiring some weeks and makes getting dinner on the table quickly a priority! 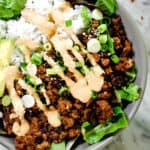 This Korean beef bowl is great because you likely have all the ingredients on hand already or will only need to grab a couple of things at the store, and you’ll have it all ready to go in about 25 minutes! 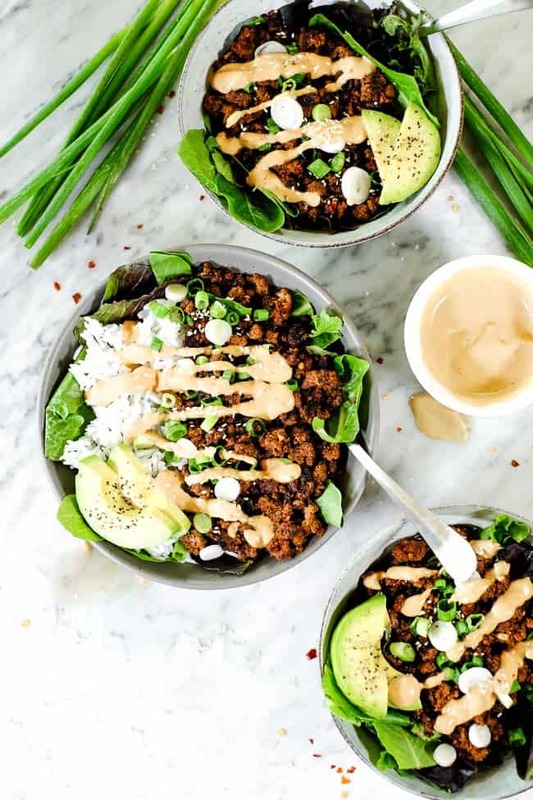 We love cooking with grass-fed ground beef mostly because it’s easy and it always tastes great! It’s also really versatile. 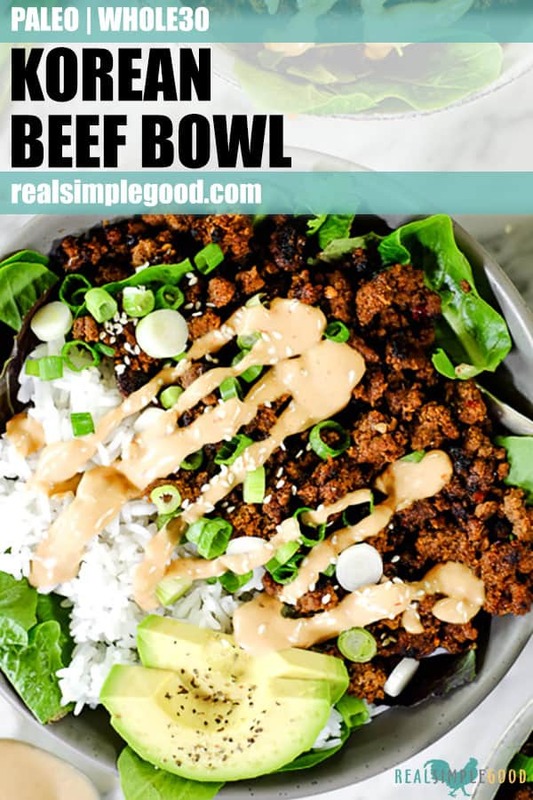 You can make something like this Korean beef bowl or you can make patties/burgers or meatballs, etc. Then, switch up the seasonings, veggies and sauces, and it takes on a different flavor every time! What are some of your favorite ways to cook with ground beef? Have you caught onto my favorite way to eat yet?? 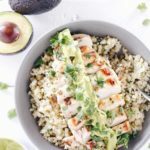 Bowl meals! They rock my world. I used to like all of my food separate when I was younger, like nothing touching anything else. I’d eat each thing separately. I was doing it soooo wrong! 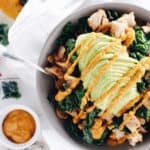 These days, I love making bowl meals and mixing everything up so that I get a little of all the flavors in every bite! It’s so much more satisfying, and of course my favorite way to top a bowl is with a yummy sauce. The sauce on this bowl is optional, but I highly recommend adding it! It’s only 2 ingredients and extra tasty! Fall seems to be one the busiest times of the year as everyone shifts back into a routine and schedule again. 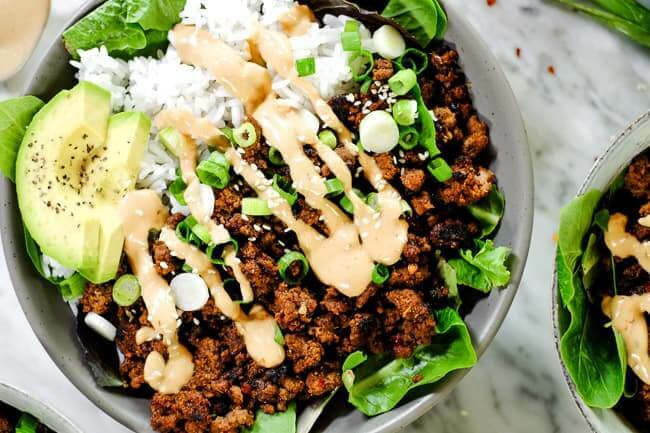 Make life easier by adding this Korean beef bowl to your meal plan! Your family will enjoy it, and you’ll really enjoy how quick and easy it is to make! Leave a comment below to let us know it goes. Also, take a pic to share on Instagram! Tag us @realsimplegood, and give us a follow if you don’t already. We’d love to stay connected! 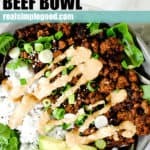 This Paleo + Whole30 Korean beef bowl is ready in under 30 minutes and is a family-friendly meal! It's gluten-free, dairy-free, and makes great leftovers! Start by preparing rice to have it ready. If serving with cauliflower rice, wait until the beef is almost done as it only takes a few minutes to cook. Dice shallot and grate ginger to have it ready. Heat a large skillet over medium-high heat and add sesame oil. Once hot, add in ground beef. Break the beef up into small bits. Add the shallot, ginger, red pepper, garlic powder, onion powder and salt and mix with the beef. Continue cooking, stirring occasionally, until the meat is browned and developing some crispy bits, about 8 minutes. Add the coconut aminos and fish sauce and cook for another 3-4 minutes. If you are making the optional sauce, mix the mayo and hot sauce in a small bowl. 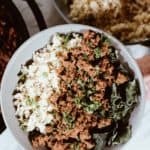 Serve beef in a bowl over a bed of greens with rice or cauliflower rice. Top with optional sauce and enjoy. 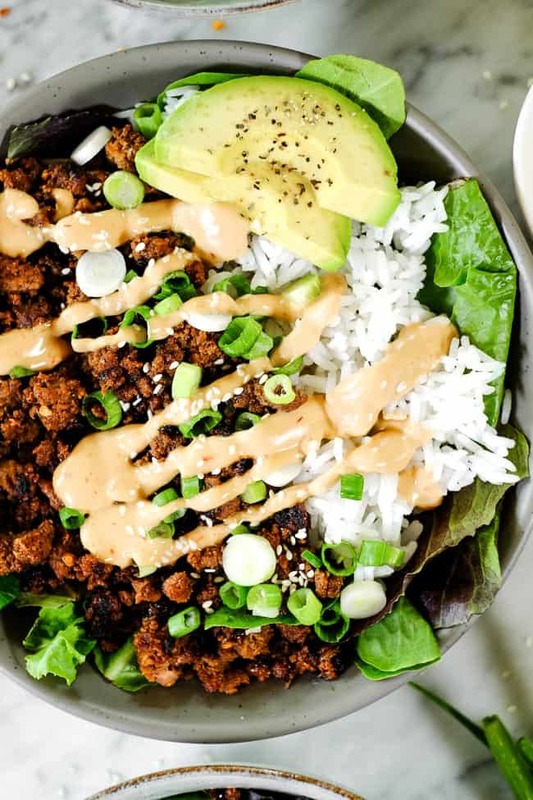 Bowls like these are always my favorite go-tos because they’re easy to make and delicious! I’ve never really tried a recipe like this before so I’ll be giving this a try later this week! Thank you! This looks really delicious. I just wish the picture was what the recipe was. The picture has avocado and scallions and a couple other things not in the recipe. You can always add the items in the picture if you want those! So glad you liked it :). As always this recipe was delicious! Very well received with my dinner guests that are Korean BBQ “experts”. Thank you for making a busy night dinner easy and delicious as you always do!!! Thanks Courtney! We are glad everyone liked the recipe :). Is the nutrition information available? 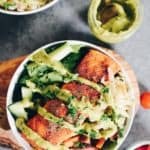 I’m doing Keto and tracking macros. Otherwise, do you know of a site I could use to figure it out? You could use any online nutrition calculator like myfitnesspal or just google “nutrition calculator”. MyFitnessPal calculates this at (per serving) at 946 calories, 39 Fat, 88 Carbs (13g fiber), and 65g protein. That is without the avocado slices you have in the picture. It seems really odd- any ideas why? That does seem high, but we can’t determine why these results may be inaccurate. I did the same thing but I realized it was calculating my garlic powder at like 1000 calories, as well as the mixed greens around 700 calories for the whole recipe. Tweak those to be more accurate and it should be in the 400 calories range depending on how you split it up serving wise! 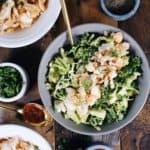 You could try the recipe without the fish sauce and it should still be ok. You might add more coconut aminos in place of it though. But why not give the fish sauce a try? You can start with a smaller amount. It adds a ton of flavor (and isn’t fishy tasting). Let us know how it goes! Question: does this recipe work for ground turkey? I’m thinking about making this tonight! 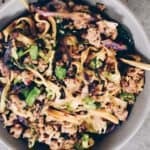 We haven’t tried it with ground turkey but I think it would work out just fine! Please come back and let us know how it turns out if you try it :). Just made this bowl tonight and I’m hooked!! I subbed the ground beef for ground pork and it’s sooooo tasty!! My parents are coming over tonight and I am going to make this. My mom doesn’t like spicy at all (she thinks black pepper is spicy). Is this recipe considered spicy? I was thinking about removing the red pepper flakes if it is. Thanks! Made this tonight for my family and I am sorry to say that we did not enjoy it. I followed the recipe to a T and it came out very salty. Otherwise the flavor was not bad. I’m thinking of turning the leftover meat into jiaozi (Chinese dumplings). Different brands of coconut aminos can be saltier than others, which brand did you use? Sorry to hear that it turned out saltier than you’d like. We haven’t tried it with Bragg aminos so maybe that brand is saltier than the Coconut Secret or Thrive brand we use. Braggs aminos are not at all like coconut aminos. Braggs is incredibly salty while coconut aminos are mild and sweet. Yes, that likely explains why some folks find the recipe too salty. Thanks for the clarification! Wow! Just made this in under 20 minutes and it is delicious! I subbed the beef for vegetarian meat crumbles and used cauliflower rice. Make sure you top with avocado, it really adds creamy goodness to it. I’ll definitely be making again soon! My family loves this dish!! We love Korean food and this is so easy to throw together. I will definitely be making this on a regular basis. Thank you!! Happy to hear this is a hit with your family! Wow. 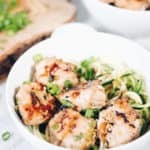 I wandered across this recipe while looking for easy, healthy, quick and delicious weekly work meal planning ideas. I made it for dinner tonite and it exceeded all my requirements! Plenty left over for the next 2 days of lunch! Tip: if anyone is making this (uh, don’t even hesitate… it’s about to be my new obsession), don’t substitute anything for aminos. It adds such depth and the right amount of sweetness!